Here is famous stage magician John Calvert's own, easy to do, Magic Memory System for memorizing from 20 to 40 words or objects. Presented as a stage or platform demonstration, you are able to memorize and recall the words as rapidly as called by the audience. From 20 to 40 numbers are shown on a wipe-erase whiteboard (or blackboard). Each spectator designates a number and a word. Note that the objects need not be called in sequence. When the board is filled, the performer - with the board out of his sight - repeats the words forwards and backwards. The mental marvel is also able to recall the word at any figure, or, if given the word, immediately states its position in the list. Many, many memory tests have been advertised - yet, Bob Nelson believed that Calvert's method was the easiest and quickest to learn and present. 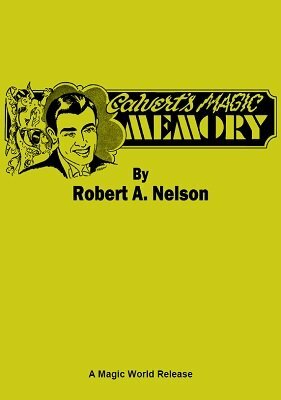 Within an hour, you, too, can present the famous John Calvert Magic Memory effect. Are you a Nelson collector? This was Item Number 153 in the Nelson Enterprises catalog . Now you can fill that missing spot in your collection.